Eating well balanced, nutrient packed meals pays benefits well beyond merely satisfying your hunger. When you eat well, you feel well. As 2010 draws to a close, let’s take a moment and reflect on the healthiest foods of the past year. Some may look familiar, but take a closer look and you will find that the past year saw an increase in exotic foods that lead to better health. Salmon—salmon is a great source of both protein and healthy fats. This heart-healthy food is recommended by the American Heart Association because it is rich in Omega 3 fatty acids. Soy—vegetarian, vegan, or plain meat-eater, soy is derived from soy beans and packed with nutrients like zinc, omega 3s, magnesium, and B vitamins. Green Vegetables—broccoli is the MVP of this food group, toting vitamins A and C, iron, calcium, and fiber. Acia Berries—2010 saw a surge in this exotic fruit, and it’s no secret why. Acia berries are loaded with antioxidants (over 2x that of blueberries). Antioxidants nutralize free radicals in the body, preventing cellular damage and leading to overall better health. Whole Grains—consume the recommended 4-5 servings of this food group each day and you’ll get an army of complex “good” carbohydrates, as well as vitamin B, E, magnesium, iron, and fiber. Increasing the frequency with which you consume the above foods will better your overall health in several ways. First, each of these foods contains a substantial amount of high quality calories, with the exception of green vegetables. It is important to ingest plenty of calories throughout the day to minimize those late-night hunger pains that usually lead to sugary snacks. 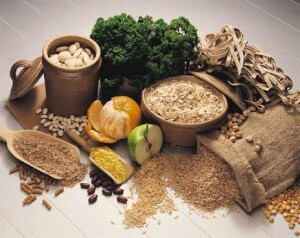 Second, each of the above foods is rich in vitamins, minerals, antioxidants, or omega 3 fatty acids. These nutrients are essential in promoting longevity and vitality, helping your body to stay healthy. Omega 3s, in particular, have the added benefit of lowering LDL, or bad cholesterol. While seemingly out of place on the Miami Dentist Blog, nutrition information is nevertheless a cornerstone of dental education. Holistic dentistry takes the approach that dental problems may actually be manifestations of other deeply rooted problems. Often times, these problems stem from poor nutrition. By taking the holistic approach and identifying causal factors, holistic dentists are better able to educate patients and ensure the problem does not persist. To learn more about holistic dentistry and the perceived interconnectedness of the body, visit our interactive Meridian Tooth Chart. There, you will find that each tooth is thought to be linked to specific organs, glands, and other body elements.